Fred parked the Mystery Machine in a parking lot at Venice Beach earlier this afternoon, and the gang hopped out for a Labor Day weekend beach bash they knew they wouldn’t get to enjoy because some kooky monster would no doubt put them on a path to solving a mystery. That didn’t happen. 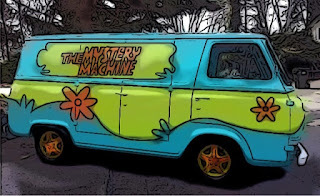 The Mystery Machine will stay put. Scooby-Doo shared Shag’s sentiments with an, “Arrr-uuuu.” Fred, Velma and Daphne said they feared they’d be stuck doing the same dance loop the entire weekend. Daphne spent the first two hours of the three-day weekend asking beachgoers if they’d noticed any suspicious activity, in hopes she could get something going. Most people just pointed out the dance loop Fred and Velma were doing on the beach for the previous two hours. The gang is reportedly a friggin' cartoon. So none of that s__t was ever going to get real. Welcome to the club.